Sportlend allows you to create your own sports site. It is adapted to sports workers. It gives you a complete control. Everything is in one place, easily accessible. Royal Soft is small web development company from Serbia, from "royal" city formed from a love of designing, creating and maintaining websites. We have years of experience in all areas of web application development using the latest technologies, as evidenced by our many satisfied clients. 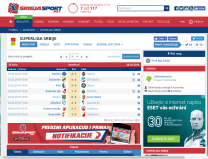 Sport software Creating web sites for sports clubs or organizations. Based on years of experience we have in making sports sites and applications, we can offer you a solution that will promote your club or sport. Website design We design and develop websites for a wide range of activities and services, each of which corresponds to the objectives of the business. We pay full attention to the interface is simple and user-friendly. Digital marketing Digital marketing is the new age of marketing. We develop online advertising system in cooperation with partner sites at affordable costs, which can allow you to promote your business online. Web development We offer development services for web sites and applications that comply with current standards. We are working on the latest technologies and procedures for the development of secure and reliable web solutions. Ecommerce solutions Ecommerce is the new face of the business world, which easily allows you to reach potential customers worldwide and offer your services and products through Internet directly.